I've got a couple notes for Thanksgiving. First, I wrote this back in 2008, and it holds up well as my advice on beers for the holiday. As some of you know, I also do some writing for Origlio Beverage, a large wholesaler here in Philly that was the Craft Beer Wholesaler of the Year in 2009; here's what I did for them last year (PDF link; my story's on page 12). There's also this from Local 44, where they note that -- in keeping with their name -- this is that time of year when everyone goes "home", leaving the neighborhood bars to the locals (and their friends and relations who have come "home," which is why Thanksgiving Eve is the busiest bar night of the year). They always make a big deal of Thanksgiving (though they're closed on the actual day, which suits me fine), and here are two things going on there that I thought you would like to know about. Starting TODAY thru Wednesday, Nov 21 we've got special "Impress Your Friends and In-Laws" prices on all LARGE FORMAT bottles (aka those really big suckers we keep tucked behind the bar). We've been stocking up on some exciting new large format bottles -- don't go to dinner empty handed! I just did a piece on gluten-free beer for Massachusetts Beverage Business, should be out in the next issue: the upshot is that gluten free beers are much better than they used to be, and so is cider, another beer-strength gluten-free option. And you wouldn't want to exclude your celiac friends from the holiday fun, would you? Is That Another Growler I See? I spotted what I'm pretty sure is an old-style growler back in August here. It's in a John Sloan painting in the Philly Museum of Art. Regular reader Steven Herberger spotted another, and I got permission to link to the picture: it's at Print Magazine's website. Take a look. Check the large pail the slack-bellied fellow with the spade is holding. I don't believe he's bailing out a ditch he's dug; I'm pretty sure he's supposed to represent 'immigrant labor.' Let's leave the stereotyping out, though (the point being made is that while the scary Papa Doc-type black man, and the slob of a ditch digger, and the scary Italian extortionist, and even the dopey white guy get to vote, the beautiful, virginal woman does not), and focus on the growler. Cathy and I went to the wedding of our old college friend Scott Fasnacht to Aimee Achorn this past weekend. It was a fantastic weekend, got to see a lot of old friends, including Scott's father Claire, who's getting up there but is still sharp, and Scott's brother Jim, an old friend himself from a different angle (things like this happen when you all live in Lancaster County...). Anyway...the wedding was in Elizabethtown (the rehearsal dinner was at the Liederkranz in Lancaster, and man, do they have a great beer selection), followed by a reception at the Hershey Country Club, where we were stuffed with great food (and some really good Bordeaux) and danced happily -- even me -- to the swing tunes of the Rob Stoneback Big Band (Rob's also an F&M alum, class of '73). Fantastic band, best I've heard in years. So...the party's over around 5:30, and we're at loose ends, so...I suggested that Tröegs was right down the road from the Hotel Hershey, where we were all staying (and they had no Tröegs on tap, though they made me some excellent Old Grand-dad Manhattans), why don't we head down there? 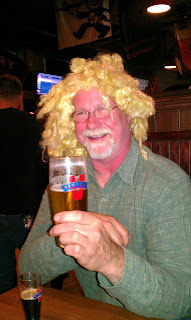 No one else had ever been, so we went back and changed, consolidated cars, and while Cathy and another wife went next door to the outlets, I went into the brewery with four of my best friends: Eric Noll and his wife Georgie, Tom Curtin (Thomas's godfather), and Larry Tighe. We had a great time! Saw Ed Yashinsky and some of the Tröegs crew at the front, said hi, that got tucked into some Perpetual IPA and Scratch Fresh Hop, and we all started telling stories. The place was hopping, loud and happy, and the beer was excellent. I'm almost relieved there's not a place this great near me; I'd be there four times a week! This was my first time at the brewery when it's been busy, and it is a LOT of fun. If we'd been hungry at all, we'd have tried some of the food -- it looked great -- but we were all still stuffed. Great weekend; great beers. If there's an American craft brewery that makes me think, 'Yes, a cookbook from them would be a great idea' more than Allagash, well, I can't think of it. I've been drinking Rob Tod's exceptional beers almost from the beginning, and from the first time I visited the brewery -- a long time ago, I love Maine -- we've had a conversation going about great food. I still think one of the very best beer/food pairings I ever had was at a Monk's Cafe "coastal beer and food" dinner where Stephen Beaumont had paired Allagash Interlude with snails in a buttery sauce in a huge hunk of puff pastry. It was a brilliant pairing: the knife-sharp dryness of the Interlude cut right through the richness of the sauce to marry with the snails. So it was no surprise to get notice of an event at Pub and Kitchen next Tuesday (11/13, 7-9, PAYG): the launch of Allagash: The Cookbook. 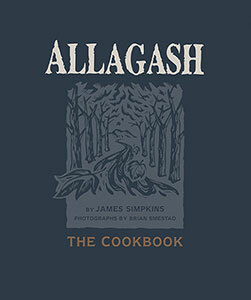 Chef James Simpkins has worked with the brewery to create a culinary tour of the United States, accompanied by the wide range of beers Allagash continues to produce. The launch will feature Rob Tod and P and K chef Jonathan Adams presenting two beer and food pairings, and four Allagash beers: White, Hugh Malone, Smoke & Beards, and Fluxus '12. Always a pleasure to see Rob in Philly; always -- always -- a pleasure to taste fine food pairings with Allagash. You know I love the session beers. 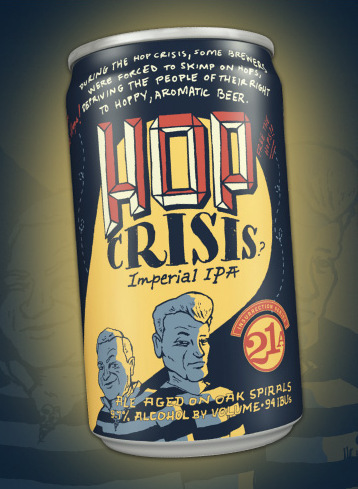 And you know I love the 21st Amendment Bitter American in particular, because it's a perfect American session beer: hoppy, drinky-drinky, and it comes in a can. And it's got a picture of a monkey on the can, so that's just a bonus. 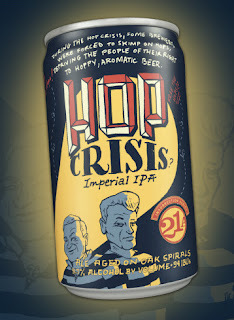 But just to show you I also love me some big old beers -- as if you needed more proof -- I cracked out this can of 21st Amendment Hop Crisis I've been saving...Election Day seemed like a good time to do it. It poured light gold, some white foam up top, and just a bit cloudy with hop stuff. The nose was awesome; pine and citrus zest boiling off of there with proper West Coast vigor. Now...this is aged on "oak spirals," and I wasn't sure how that would go. There was a breadth to it, not quite a creaminess but a rounding of the malt/bitter interface kind of thing that I found interesting. The bitterness was crushingly good, especially with fairly hot batch of chili we had for dinner; Hop Crisis banged right through that, and the spice perked up the bitter (as it will). I'd do another, if I had one, and I'll happily do a bit of crisis management the next time I see one. I'm going to be on the panel at another Philly Beer Scene Beer Laws Forum at Yards Brewing again, this Thursday at 7 PM. Hope you can come out; we had about 100 people last time, and I'd love to see more of you this time. Details on the forum can be found here, but I'd like to use this post to get you prepped up for the debate. The panel's going to be State Senator Chuck McIlhinney, representing the PA Legislature, Bill Covaleski of Victory Brewing, representing the brewers of Pennsylvania, and Mike Gretz Sr. of Gretz Beer Distributors, representing the beer wholesalers, Tom Kehoe of Yards, who is moderating the thing, and me, who's pretty much representing you, the beer drinker...or as I like to call us, the fourth tier. We wanted to let you know what kind of things are going to come up. These are some questions we've been tossing around. First and most important: what can people do that's effective to stand for what they believe in about changing the state's liquor code? How do we effect change through the Legislature? We'd like to ask you, our beer-centric audience, how much spirits you buy in PA. Do you buy much wine and spirits at all, and when you do, do you buy them here, or do you cross the border. We'll do a show of hands, but if you want to comment here, that's good too. We'd also like to know if privatization of the state liquor stores interests you...and if it does, where do beer sales fit in that? Why is a simple sixpack sale change to the Liquor Code is so hard to make when Pennsylvanians overwhelmingly support it? What do you want? Do you want to do away with the case law? Privatize the state stores and make them "all alcohol" stores? Sell beer and wine in every grocery store? Or just increase the number of licenses? And what seems like a very simple, reasonable request from Tom Peters at Monk's Cafe: Can it be arranged that a restaurant licensee could get a "one-time" permit to receive beer from a currently unregistered brewery, pay the applicable taxes, and not have to go through an Importing Distributor? That's what we're thinking about. We hope you're thinking about coming out Thursday night. Remember: privatization isn't over, the sixpack law change isn't over, they're just on legislative holiday. Next year it all starts up again, and we want something to happen. This is where that starts. And yes, the bar at the brewery will be open for business. Debating is thirsty work. Ron's real hair. He wears a baldy cap. 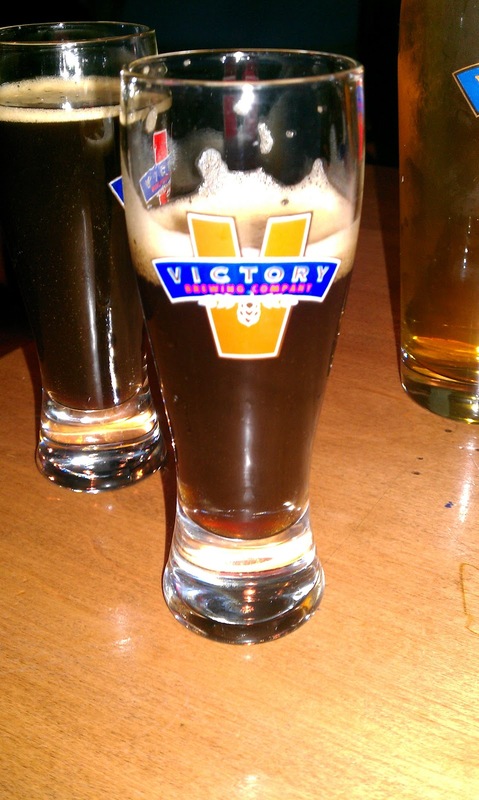 Served with the full complement of Victory drafts, which, I hasten to point out, is awesome on any day, and sure to be excellent on this day. It will also include Red Thunder; you tickers can get tasters, the rest of us can get full 12 oz. pours, and you can even purchase up to six RT bottles to go. Such a deal! So how was the Red Thunder? Well, bearing in mind that what I had was a five year old bottle sample of a pilot project...it was pretty damned good. The cocoa/chocolate richness of the Baltic Thunder was still there, but the berry/pitfruit flavors of the big dark booger had been attenuated and refined by the red wine oak's fruit and tannins. It's a sophisticated drink, not a whack-in-the-chops stunner, and I quite liked it. Mind you, I quite liked the slow-pour Braumeister the goofy booger with the blonde curls at the left suggested I follow it up with, too. Remember the timing, too. You can go get a Victory breakfast, with Victory beers, and score your Red Thunder (up to a case, and if you want more -- greedy sod -- there WILL be more available throughout Pennsylvania, New Jersey, Maryland, Delaware, Illinois, Massachusetts and Ohio)...and then go catch the opening day of the remake of Red Dawn. Wow. Now that's a day, huh? Wolverines!! !